In the animal kingdom, mantis shrimps just might have the all-seeing eye. Fig 1. A peacock mantis shrimp (Odontodactylus scyllarus) looks out from its shelter. (Source: Prilfish). Like insects and other crustaceans, mantis shrimps have compound eyes. This means that each eye is composed of a bunch of tiny, repeating units called ommatidia. Each ommatidium (singular) is covered by its own hard cornea and functions as a single visual receptor. You can think of them as pixels on a screen. Together, the ommatidia send a mosaic image to the brain; the more ommatidia, the better the image. Here’s some context: honeybees have about 150 ommatidia per compound eye, while some mantis shrimps have over ten thousand ! Each of a mantis shrimp’s two compound eyes also contain a ‘mid-band’ that appears to split the eye in half. This band is made up of six parallel strips of specialized ommatidia . Each strip is packed with photoreceptors, the sensitive cells that respond to specific wavelengths of light. While humans have three different types of these light-detecting cells, mantis shrimps have a whopping twelve. Fig. 2 The eye of an O. scyllarus mantis shrimp. Here, the mid-band is visible stretching horizontally across the center of the eye. (Source: Marshall et al. 2007). All of these photoreceptors put the shrimp’s visual range into the ultraviolet region, and some even specialize in seeing polarized light. Wavelengths of natural light are capable of travelling in any variety of directions. When light is polarized, however, all of its waves travel in one direction, on a single plane. This type of light is only perceived by humans when we see partially polarized light reflecting off of the surface water or glass. However, mantis shrimps are much more sensitive to polarization, and probably use it to see their underwater world in higher contrast. In addition to seeing it, many species of mantis shrimp have body markings that reflect polarized light , which may be used in communication . These special body markings pose one problem, however. In the sea, a handful of other animals, like cuttlefish and octopuses, can also see polarized light patterns . Since these animals would love nothing more than to snack on a tasty mantis shrimp, some species have taken their secret polarized light code one step further and developed sensitivities to circularly polarized light . In addition to moving linearly, polarized light can also move in helix-like formations. In general, this happens when two waves of light travel on planes that are perpendicular to one another. 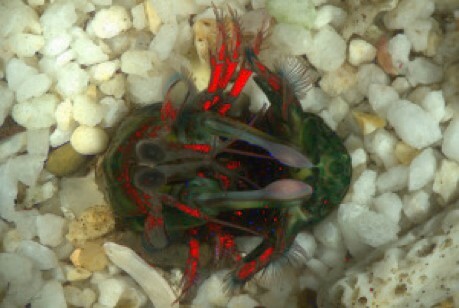 One species of mantis shrimp, Gonodactylaceus falcatus, may use circular polarization to help detect when a cozy shelter is already occupied. These animals often make their homes in holes or crevices on the seafloor, but must avoid occupied shelters to avoid injury. When presented with burrows covered with circularly polarized light filters and unpolarized light filters, mantis shrimps showed a distinct preference for entering shelters reflecting unpolarized light . Fig. 4 A mantis shrimp perches inside its borrow, displaying markings that reflect circularly polarized light. (Source: Gagnon et al. 2015). The position of these markings may also be a clue to their function. 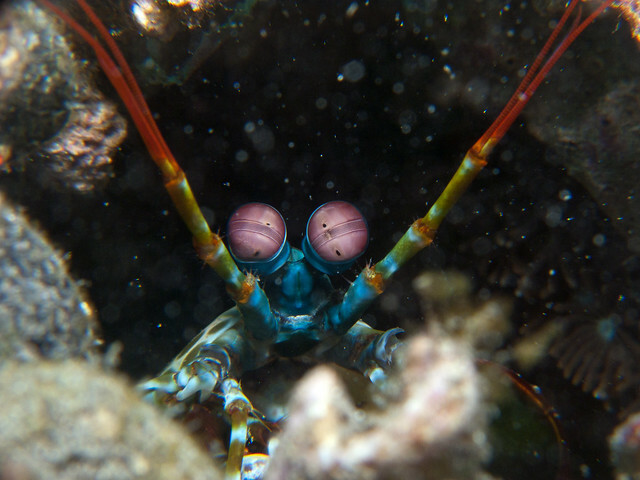 Their positing around the face and claws suggest an involvement in aggression, because mantis shrimps typically display these areas during fights . However, scientists will need a few more clues before we can fully crack the mysterious codes involved in mantis shrimps’ secret signaling and vision. Marshall, J., Cronin, T.W., and Kleinlogel, S. (2007). 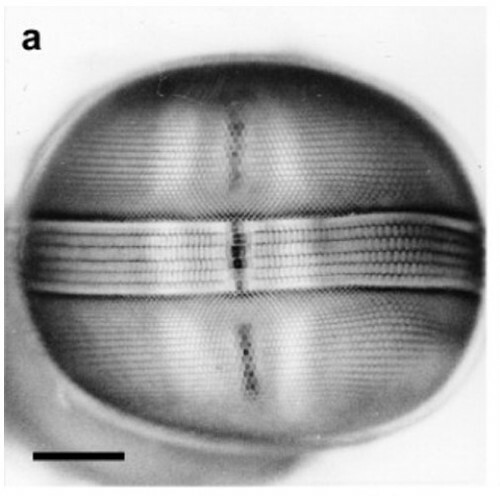 Stomatopod eye structure and function: a review. Arthropod Structure and Development. 36. 420-448. Chiou, T., Kleinlogel, S., Cronin, T., Caldwell, R., Loeffler, B., Siddiqi, A., Goldizen, A., Marshall, J. (2008). Circular Polarization Vision in a Stomatopod Crustacean. Current Biology. Gagnon, Y.L., Templin, R.M., How, M.J., Marshall, N.J. (2015). Circularly Polarized Light as a Communication Signal in Mantis Shrimps. Current Biology. 25. 3074-3078.